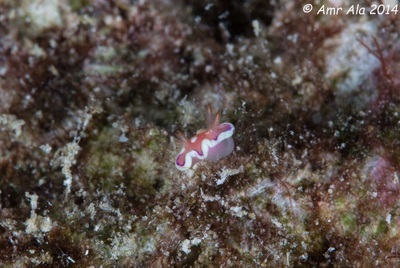 Rosy-tipped nudibranch (Cadlinella sp.) Location:Jeddah,Saudi Arabia To 2 cm. Yellowish-white; cerata with red tips. Biology: primarily on subtidal flats and in surge channels and tunnels. Feeds on transparent sponges. 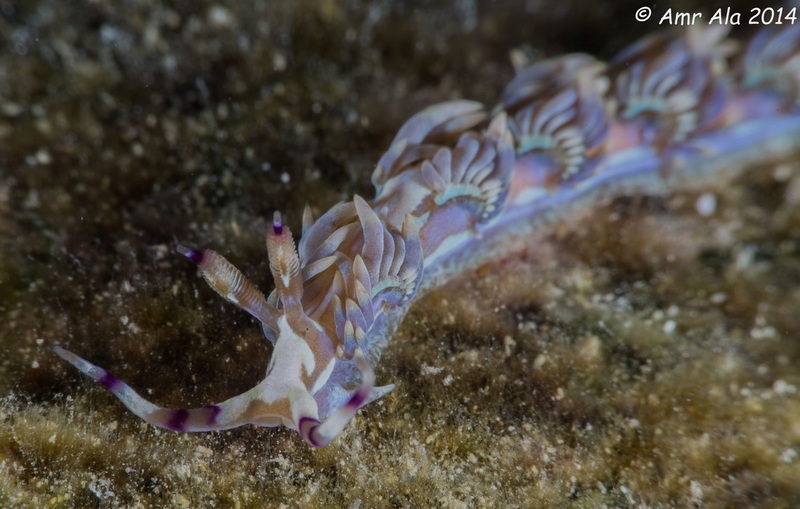 PHYLLODESMIUM JAKOBSENAE Location:Jeddah,Saudi Arabia Found on sandy bottoms and coral reefs near soft coral Xenia sp, its sole food source. 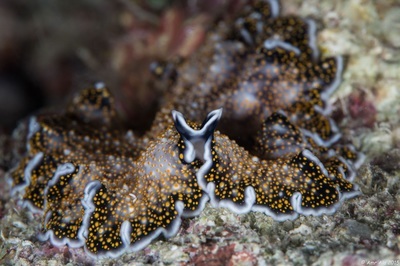 Its cerata perfectly mimic the shape and creamy colour of Xenia polyps. It can be very hard to find, because it looks like a small Xenia colony. 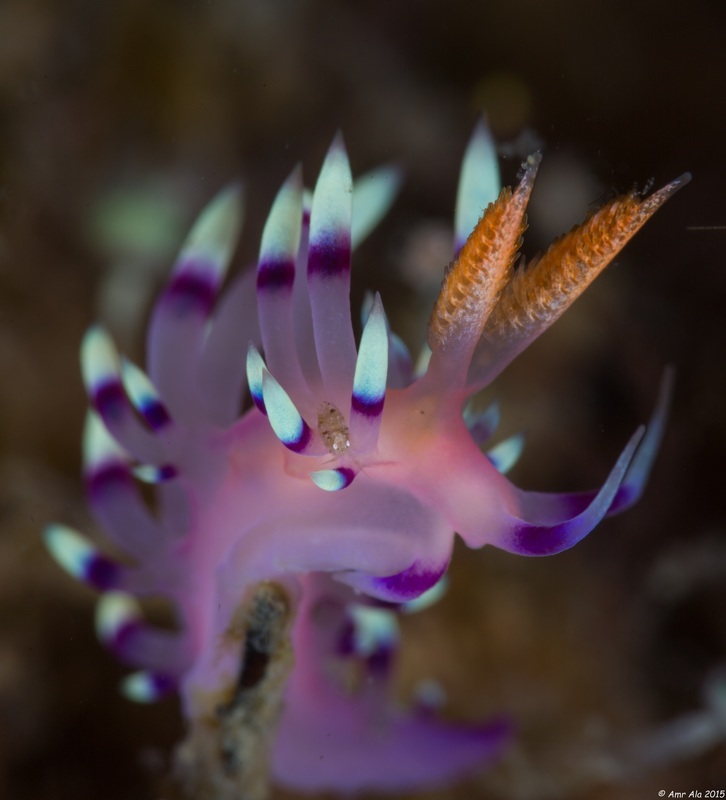 It is one of the solar-powered species as it keeps some of the Xenia soft coral algae within its cerata. Green triton (Marionia viridescens) Location:Jeddah,Saudi Arabia To 3 cm. 2 rows of tufted rhinophores along back; marbled brown. Biology: in lagoon and seaward reefs below 6 m. Usually on encrusted hard bottoms. 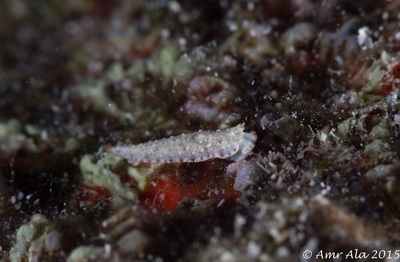 Feeds on gorgonians and soft corals. 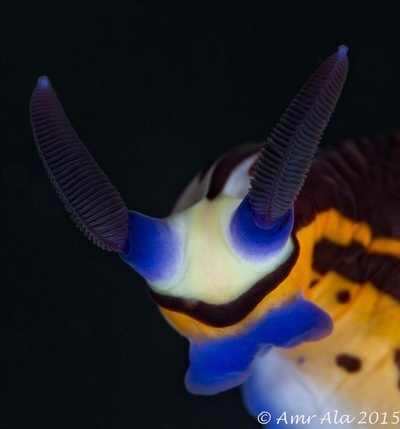 Twin chromodorid (Chromodoris geminus) Location:Jeddah,Saudi Arabia To 5.5 cm. Mantle with dark purple spots with blue rings, margin dark grey and blue. 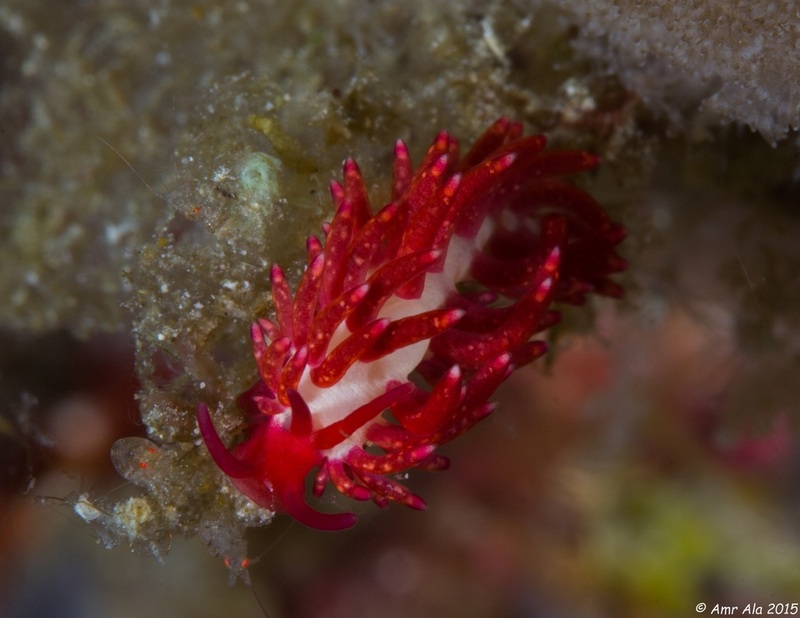 Biology: on poorly developed reefs, down to 50 m. Feeds on the red sponge Negombata sp. Red Sea nembrotha (Nembrotha megaLocera) Location:Jeddah,Saudi Arabia To 8 cm. 3 gills. Biology: on sponges, rubble or corals, 5 to 20 m. Feeds on sponges and hydroids. Swims with undulating movements. PTERAEOLIDIA IANTHINA Location:Lembeh,Indonesia They have a slender and long body up to about 15 cm. 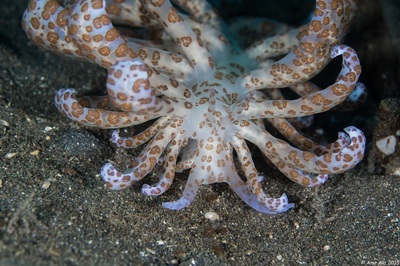 They have cerata in a fan-like cluster with a colour from white to brown to orange and sometimes blue depending on the food source and accumulated zooxanthellae. 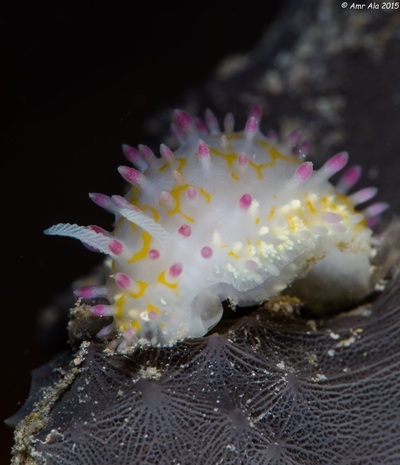 You can find them at sandy areas or on hydroids. 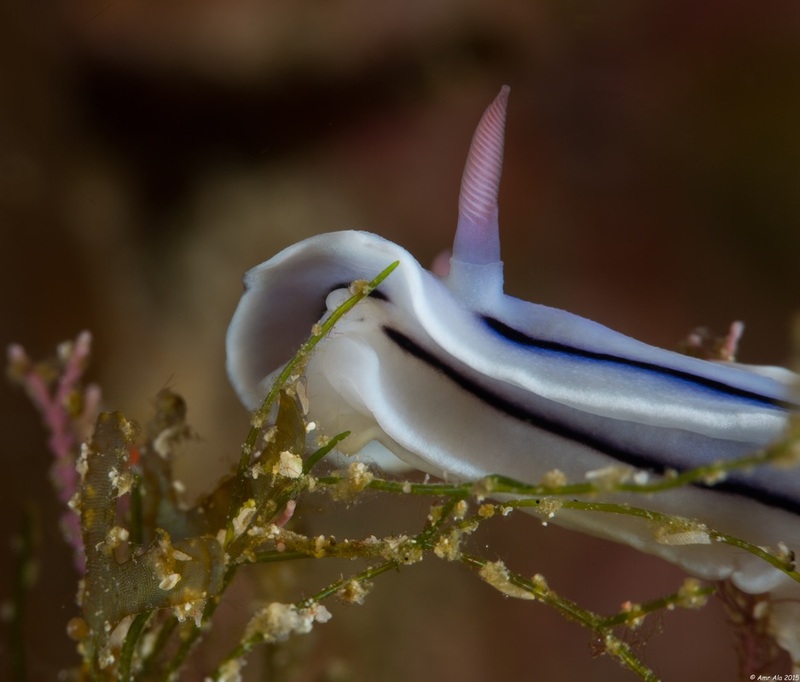 GLOSSODORIS CINCTA Location:Lembeh,Indonesia Usually found on patch reefs and beneath coral rubble. 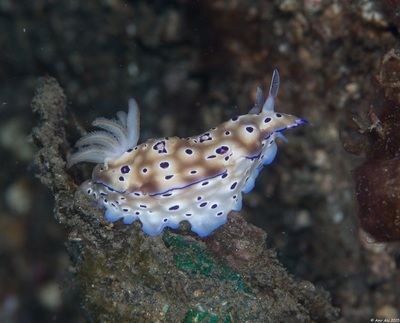 Widespread nudibranch with differing regional color patterns. The Indonesian color variation has a brownish body dotted in white, with double yellow and blue rim around the outer edge of the mantle. 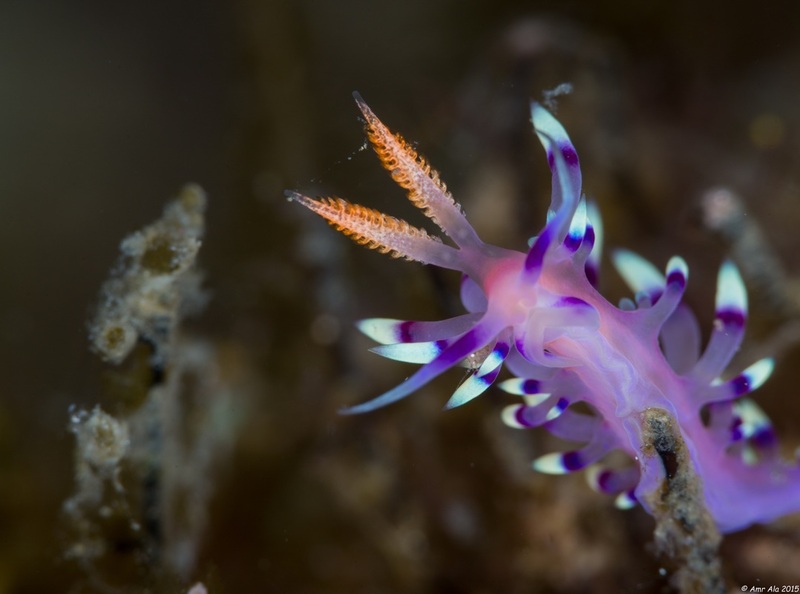 Solar Nudibranch (PHYLLODESMIUM LONGICIRRUM) Location:Lembeh,Indonesia This striking nudibranch is found on coral and rocky reefs or sandy substrate, most of the time close to it's only known food source,Probably toxic. Body size is about 14 cm. PHYLLODESMIUM MAGNUM	Location:Lembeh,Indonesia This species is large: up to 100mm in length. 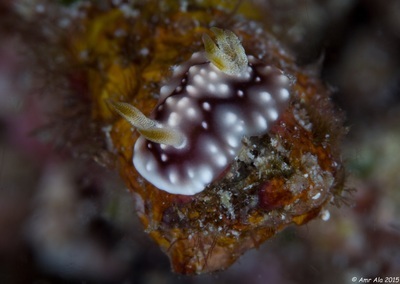 It is mostly found on sandy areas and feeds on soft coral like Sarcophyton. It has curly, fuzzy cerata and its color is purpleish with yellow blotches on the cerata. T-BAR CERATOCOMA TENEU	(Ceratocoma teneu) Location:Lembeh,Indonesia Body size is about 15 cm. Base color is orange to yellow; broad mantle has 2 or 3 lobes which are outlined in white and have a series of blue or purple dots. A toxic elongated skin flap protecting the gills gives this nudi its characteristic (T) shape. 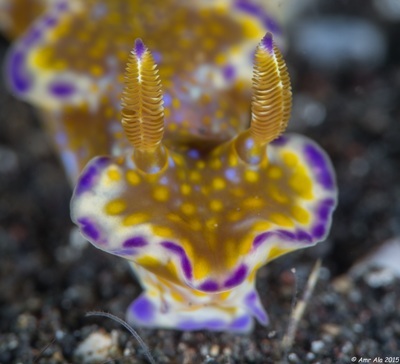 CHROMODORIS GEOMETRICA	Location:Lembeh,Indonesia It has a purple body with white tubercles and a network of black lines. 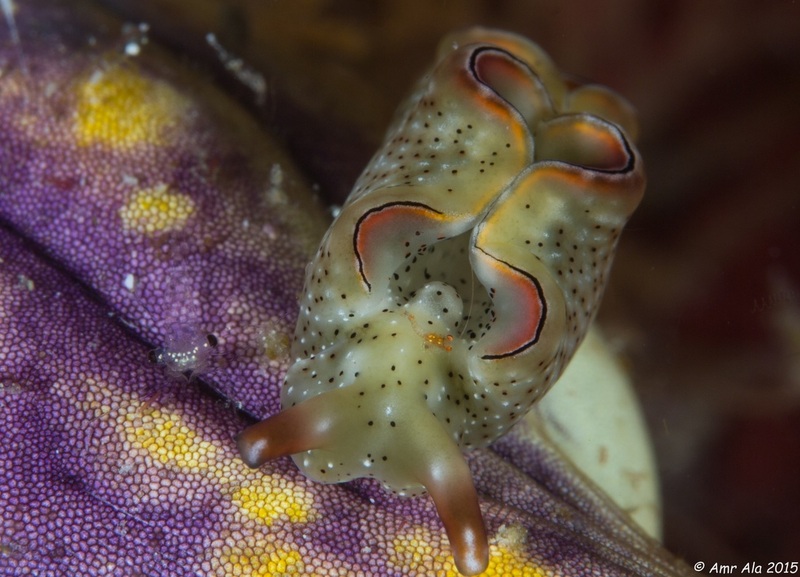 Has green tipped rhinophores. 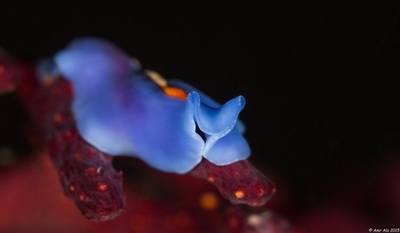 Mostly found in shallow water or rubble areas. FLABELLINA EXOPTATA	(Flabellina exoptata) Location:Lembeh,Indonesia General habitats for this species are coral or rocky reefs. You can usually see them on hydroids, feeding, mating and laying eggs. 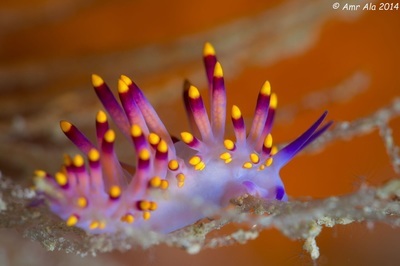 Body colour can be very variable and range from white, pink, purple to orange. 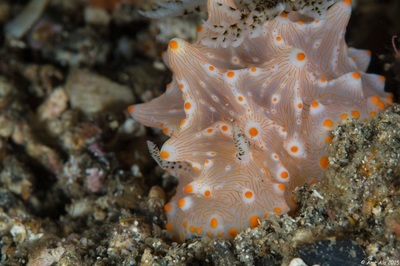 The sensory organs and the tips of the cerata are usually pale orange colour. It has the ability to reposition the stinging cells from its food source (hydroids) to the tips of its tentacles for protection. HYPSELODORIS KANGA	Location:Lembeh,Indonesia Blush grey with a combination of orange and yellow spots and some black to blue spots scattered among or mainly along edge of mantle and foot. Has blue rhinophores and red gills usually with a series of yellow spots along their branches. The body size is about 55 mm. GONIOBRANCHUS RETICULATUS	(Goniobranchus reticulatus) Location:Lembeh,Indonesia Has a white dorsum covered to near edge with a fine pattern of red reticulations, has a white edge on the mantle, gills whitish to pinkish, rhinophores dusky brownish, foot with pale bluish edge. Body size is about 80mm. 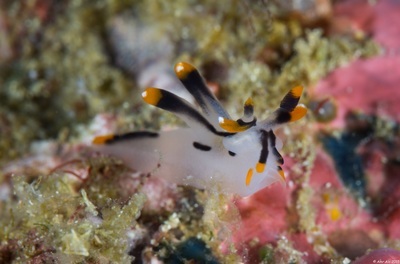 THECACERA PICTA Location:Lembeh,Indonesia Translucent white with black lines and orange-red tips on appendages and other extremes on the body. Some variations have lines breaking up into spots. The body length can be up to 20mm but is usually 10-15mm. 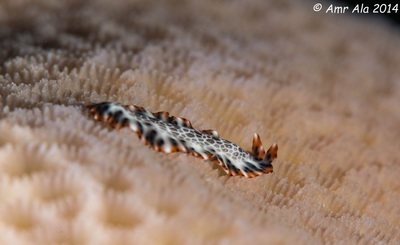 Dotted flatworm (Pseudoceros leptostichus) Location:Redsea,Saudi arabia To 3 cm. Creamy with black and white dots; marginal band yellow with black spots. Biology: under rubble or srones of shallow reefs by day. 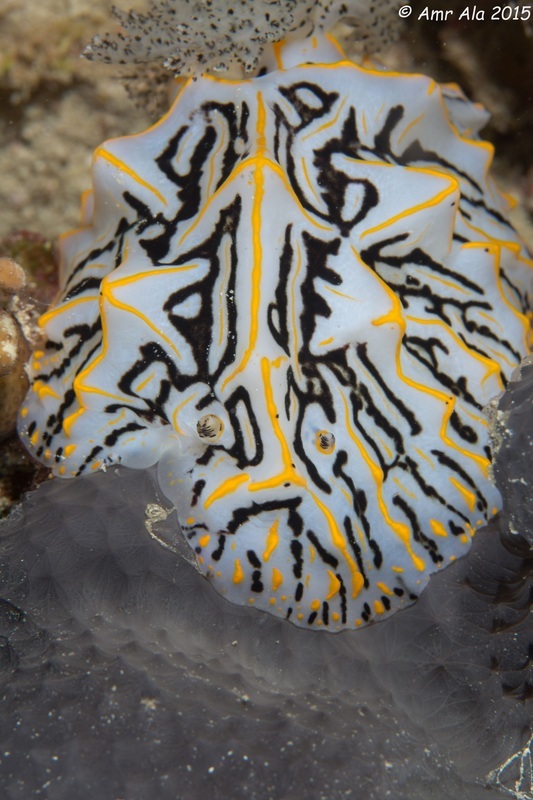 Feeds on colonial tunicates. 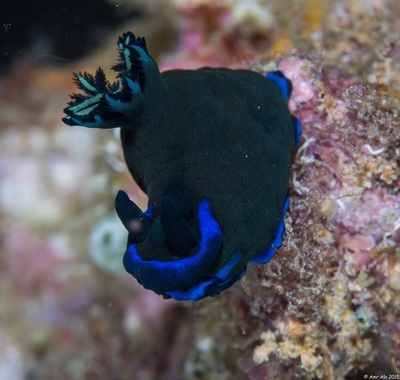 BYFURCUS FLAT WORM	(Pseudoceros byfurcus) Location:Raja Ampat,Indonesia This species is a blue and purple color mix. They have a line in the centre of their body that is orange at the front, white at the back, and outlined in a deep purple. Their eyes are apparent on the head just anterior to this line. Their size can be up to 60mm. GLOSSODORIS ATROMARGINATA	(Glossodoris atromarginata) Location:Raja Ampat,Indonesia Body creamy white to yellow. 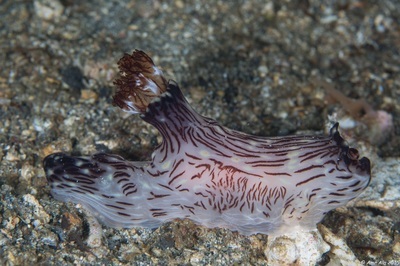 Mantle with distinct blank line on its edge which highlights the strong undulation, especially in adult; rhinophores and gills as body color with black tips. Size up to 90 mm. 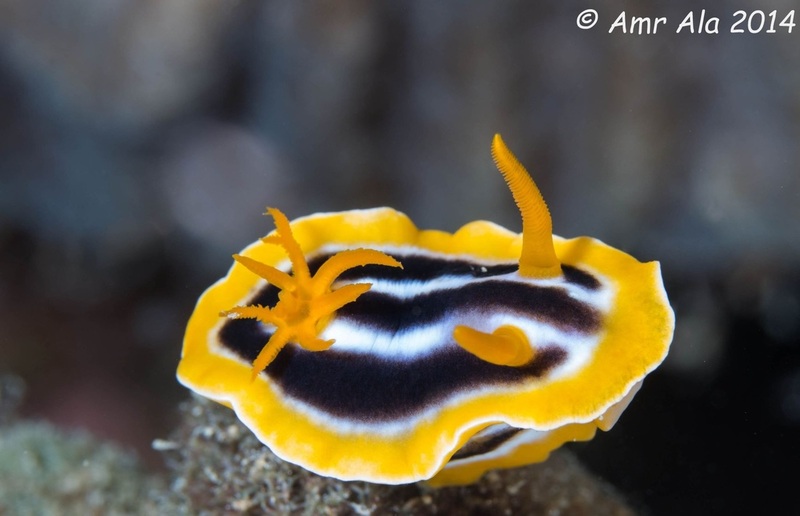 Yellow Papillae Flatworm (Thysanozoon nigropapillosum) Location:Lembeh,Indonesia Also known as Yellow Papillae Polyclad Flatworm, Yellowspot Polyclad Flatworm, and Gold-speckled Flatworm. They feed on ascidians and shelled molluscs, and grow to a length of about 7cm. They feed by placing themselves over their victims and sucking in their prey, through a tube-like extension in its mouth. 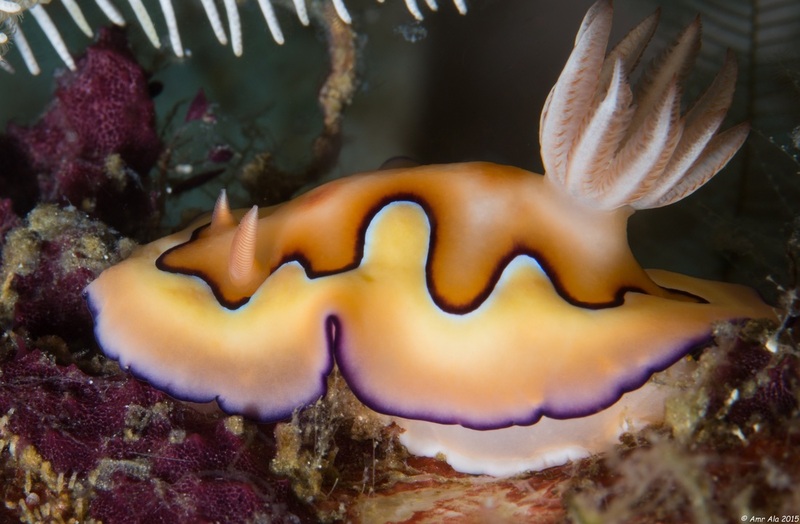 CHROMODORIS GEOMETRICA	Location:Raja Ampat,Indonesia It has a purple body with white tubercles and a network of black lines. 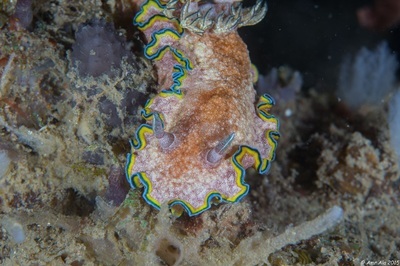 Has green tipped rhinophores. 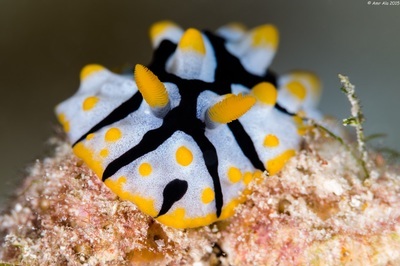 Mostly found in shallow water or rubble areas. ELYSIA ORNATA (Elysia ornata) Location: Lembeh,Indonesia This species has a yellow transparent body and has small black and yellow spots. It also has a curly orange edge and black lines at the mantle. 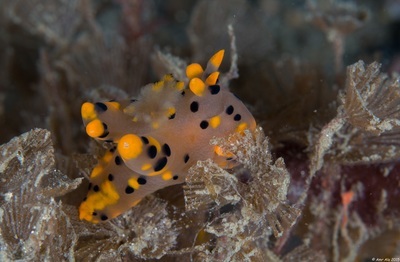 The rhinophores are also orange with black tips. 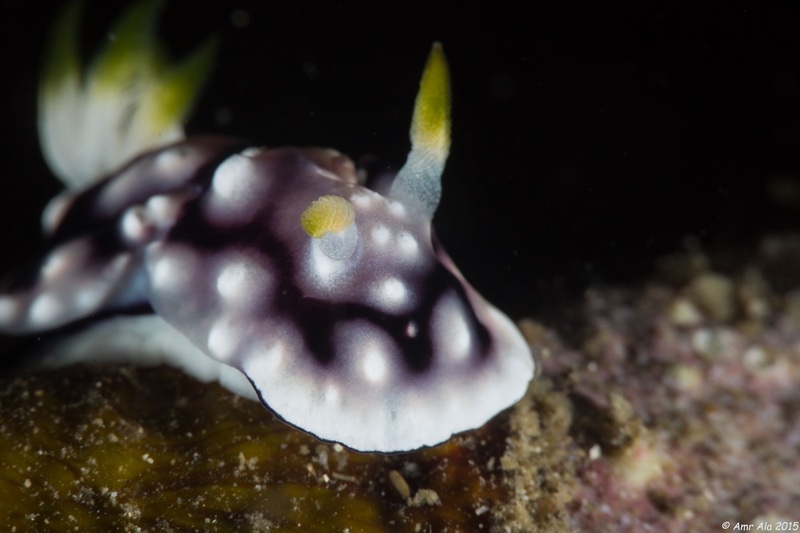 Their body size is up to 4 cm and they are found mostly in rubble or sandy areas. TAMBJA MOROSE Location:Lembeh,Indonesia This species has a black body with blue lines and spots in many variations on the body and the tips of the gills. The size can be up to 7 cm. THECACERA PICTA	Location:Raja Ampat,Indonesia Translucent white with black lines and orange-red tips on appendages and other extremes on the body. Some variations have lines breaking up into spots. 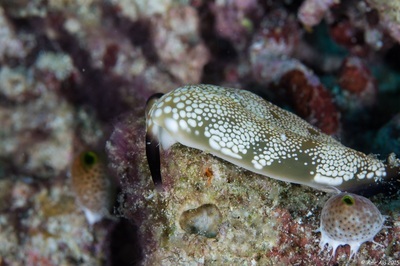 The body length can be up to 20mm but is usually 10-15mm. 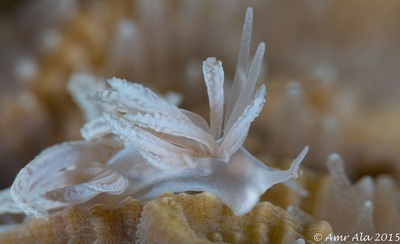 Goniobranchus coi Location:Raja Ampat,Indonesia Goniobranchus coi has a white body and foot, but is instantly recognizable for its distinct dorsal pattern. The outer part of the dorsum is yellow, separated from the inner light-brown part by a wavy white and black line. The mantle is brown, edged with a thin purple line. The gills and rhinophores range in color between different individuals from translucent white, through pale-yellow and light-brown. 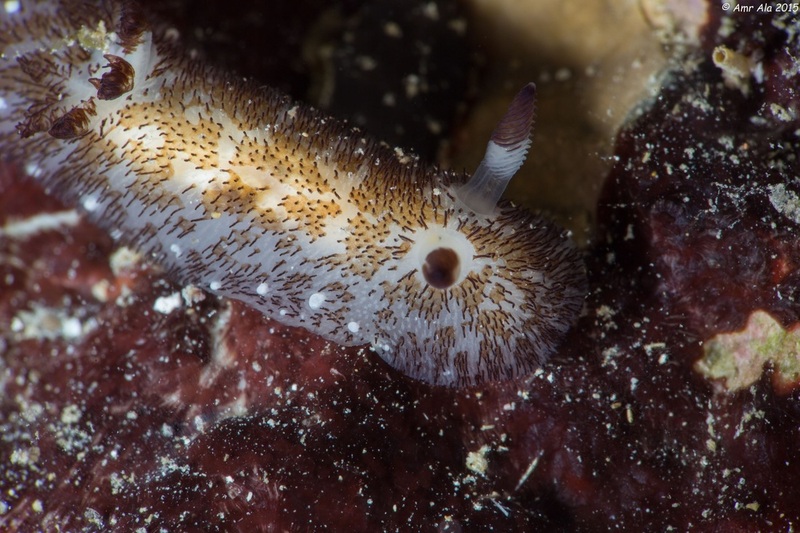 This species reaches at least 50 mm in length. 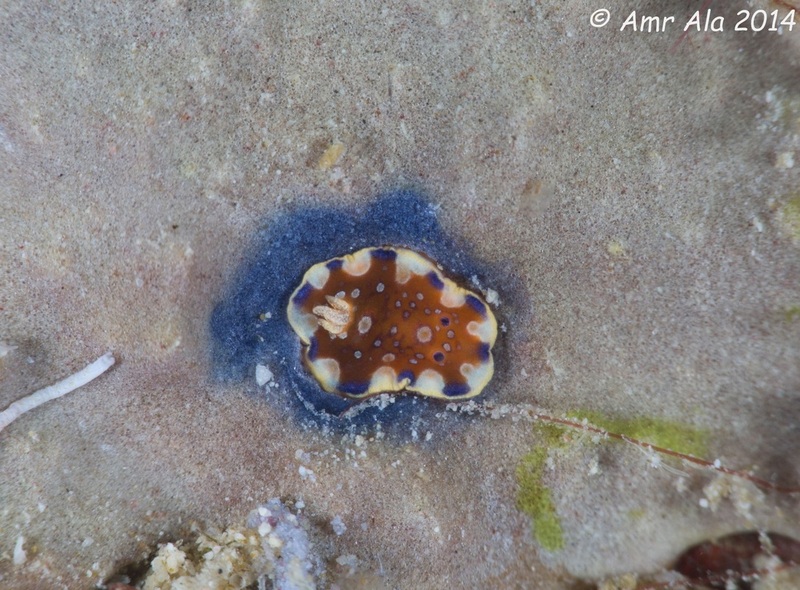 Thysanozoon nigropapillosum Location:Redsea,Saudi Arabia Thysanozoon nigropapillosum can reach a length of 5-8 cm. The upper surface of the body is black and velvety with white edges and shows dorsal rounded papillae tipped with yellow-orange. 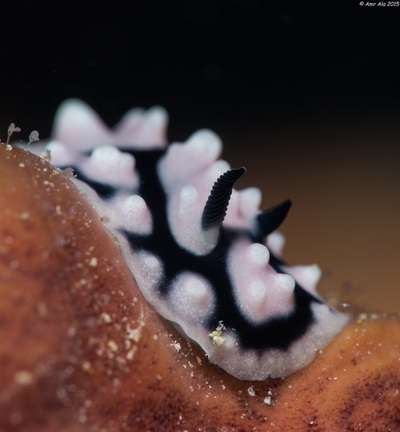 PHYLLIDIELLA PUSTULOSA Location:Jeddah,Redsea Have black base color with pink tubercles arranged in small cluster. 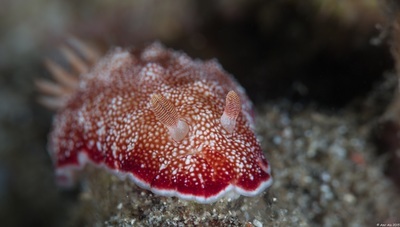 This species is very common and can be found at shallow water or also can be found at rubble area. Large dragon (Pteraeolidia ianthina) Location:Jeddah,Saudi Arabia To 10 cm. 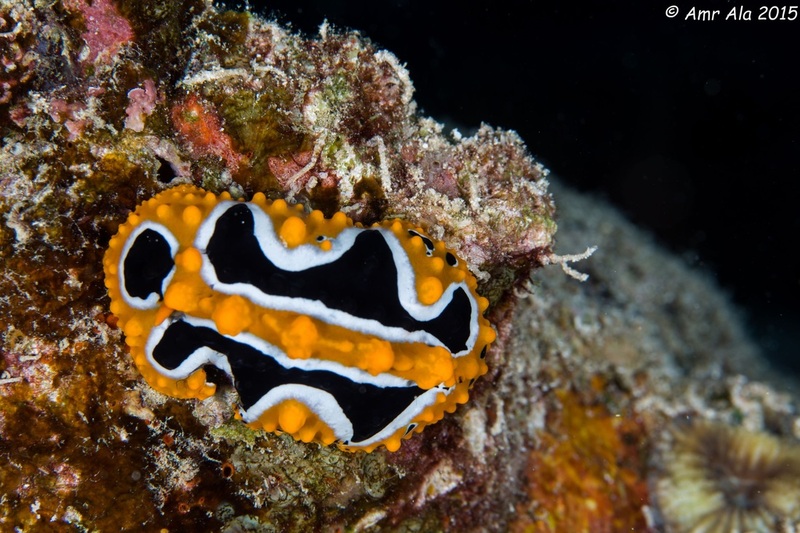 Colour variable depending on zooxanthellae in tissues. Biology: on shallow coral reefs. 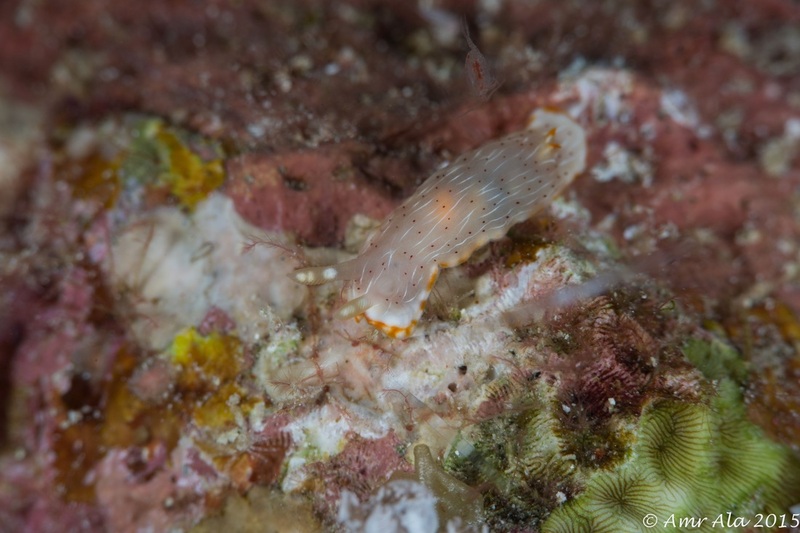 Feeds on hydroids and leather corals and incorporates their zooxanthellae as symbionts. Tiger Flatworm (Pseudoceros dimidiatus) Location:Redsea,Saudi Arabia Pseudoceros dimidiatus grows to be up to 8 centimetres (3.1 in). 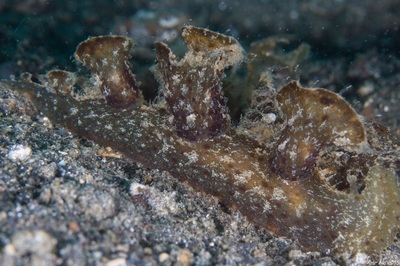 The body is elongated and oval, with a velvety dorsal surface, a grey-black ventral side and quite short pseudo tentacles formed by folds of the anterior margin. 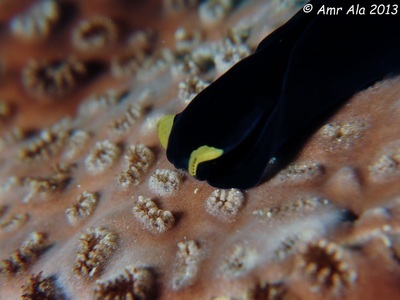 All individuals of the divided flatworm have a black body with an orange margin. 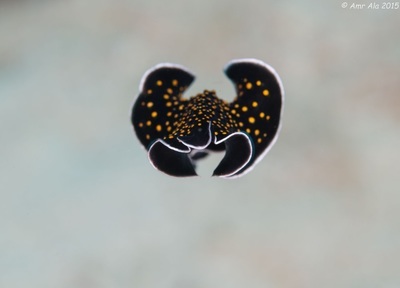 Leopard flatworm (Maritigrella sp.) Location:Redsea,Saudi Arabia To 3 cm. 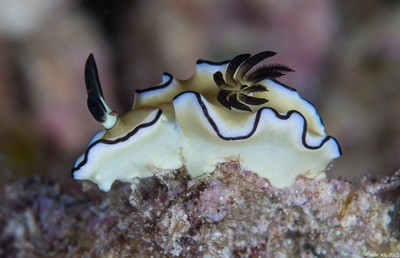 White with leopard-like black spots; marginal band with black and brown stripes. Biology: on shallow poorly developed coral reefs. In crevices and under stones by day. African chromodorid (Chromodoris afticana) Location:Jeddah,Saudi Arabia To 6.5 cm. 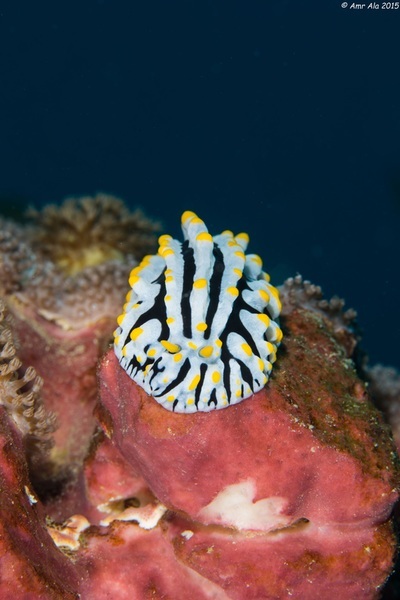 Broad black stripes with narrow white stripes; gills and edge of mantle yellow. 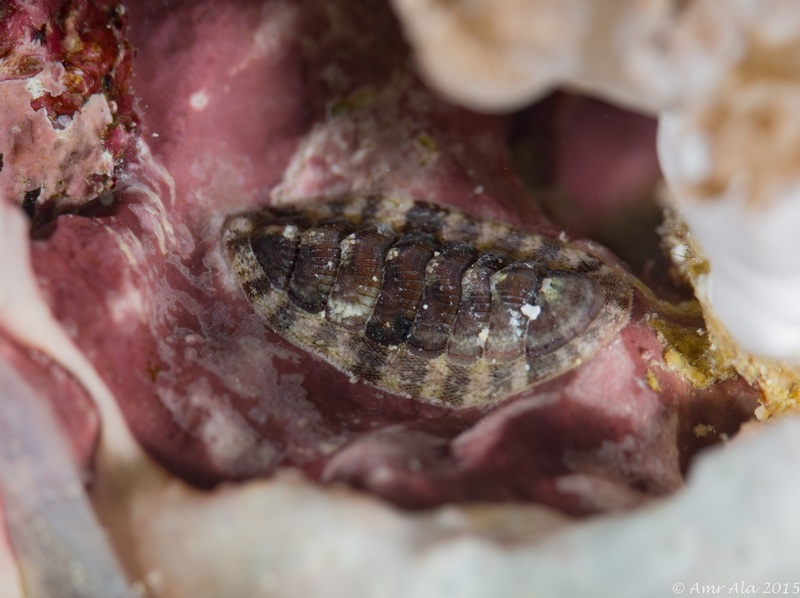 Biology: in most reef habitats, 1 to 15 m.
Red Sea chiton (Chiton affinis) Location:Jeddah,Saudi Arabia To 4 cm. Edge without bristles. 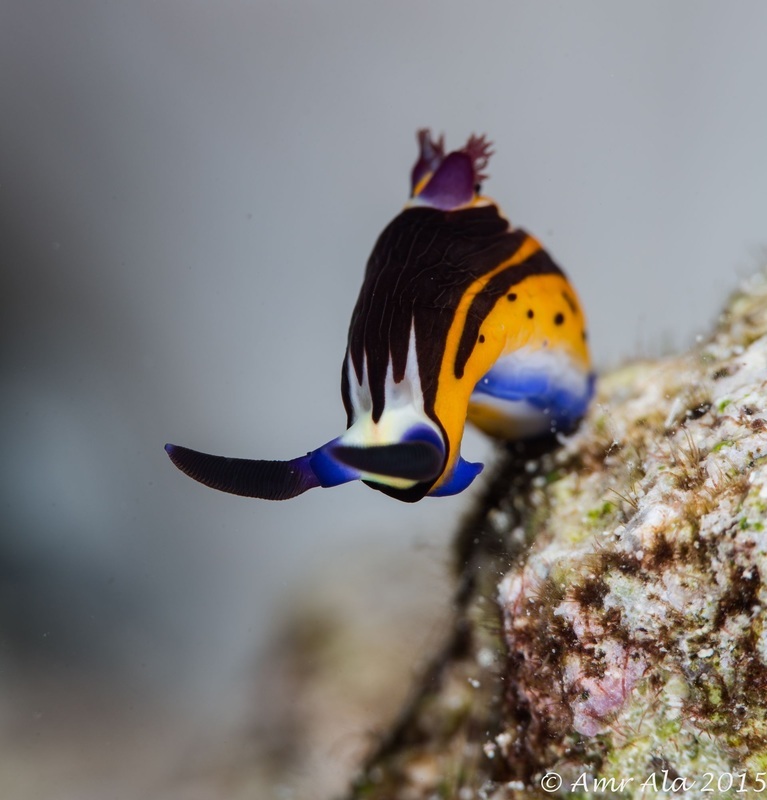 Biology: on reef flats and crests exposed to waves. Algae feeder. 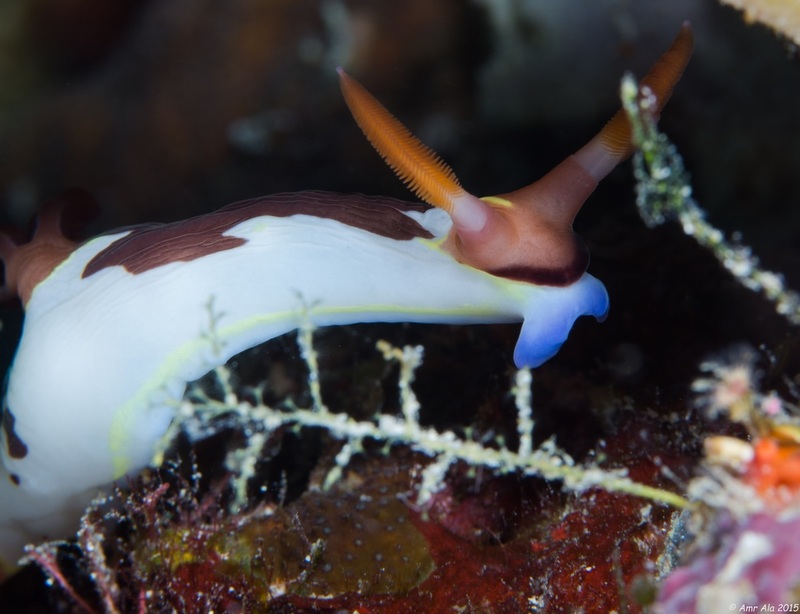 HYPSELODORIS TRYONI	Location:Lembeh,Indonesia This species can be found both in sandy and coral areas. 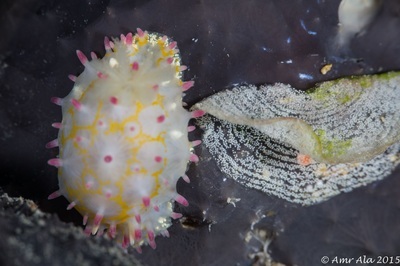 They are often seen in pairs and can be observed tailing each other. 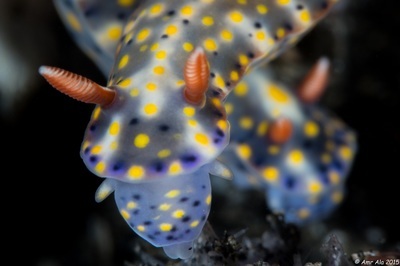 Their body length is about 90 mm. MELIBE FIMBRIATA Location:Lembeh,Indonesia This nudibranch has an ugly look and their size can be up to 200 mm. They resemble a mass of algae. Their cerata is large and they have a round oral hood around their mouth. This nudibranch feeds on crustaceans and most of them are capable of swimming by moving their body from side to side. 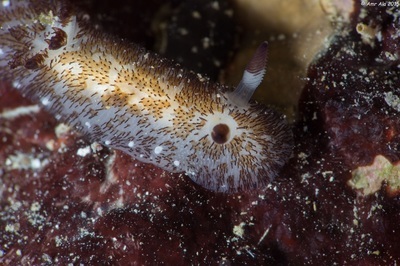 Willey's dorid (HaLgerda ioilleyi) Location:Jeddah,Saudi Arabia To 9 cm. Yellowridges with black and yellow lines between. Biology: on exposed coral reefs, in open or hidden under rocks. 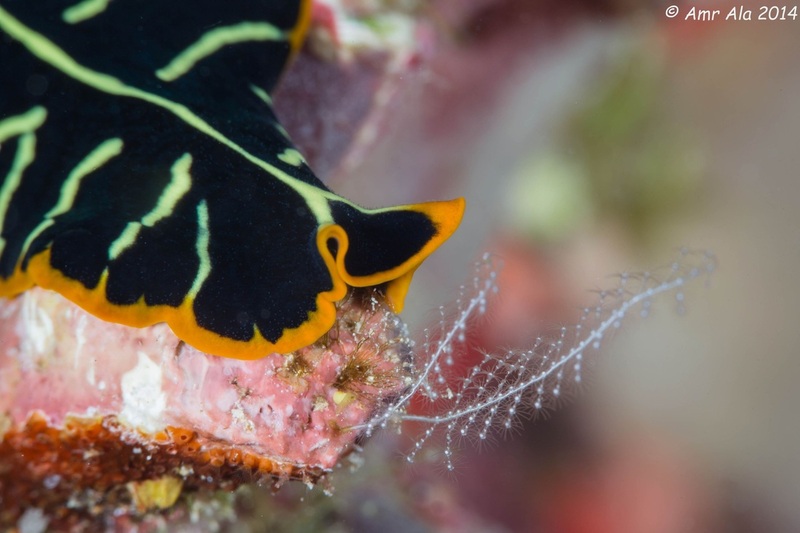 Feeds on sponges. 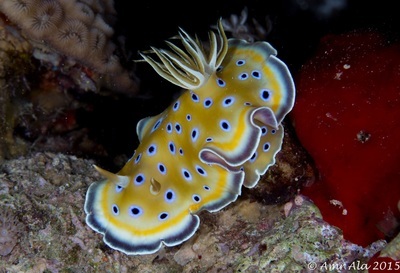 Varicose wart slug (PhyLLidia varicosa) Location:Jeddah,Saudi Arabia To 11.5 cm. 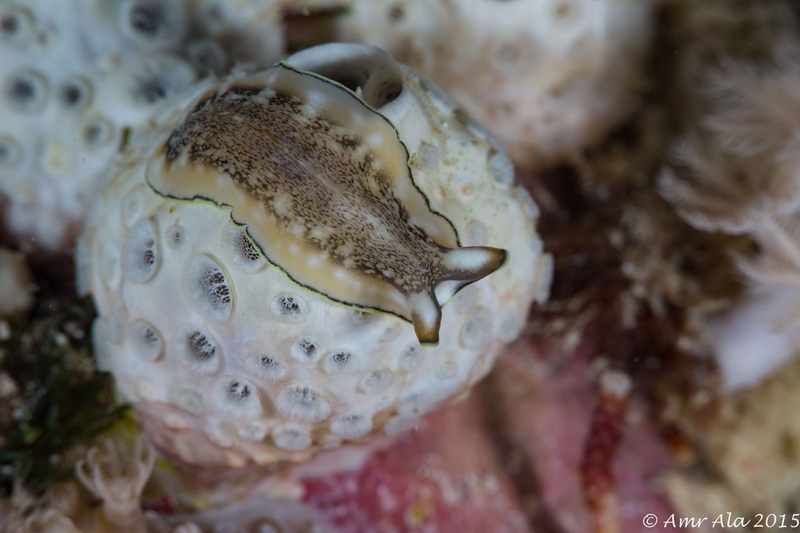 Tubercles and rhinophores yellow, a black stripes between ridges. Biology: on lagoon and seaward reefs, I to at least 30 m. Common, in open over sand, rubble or coral rock by day and night. 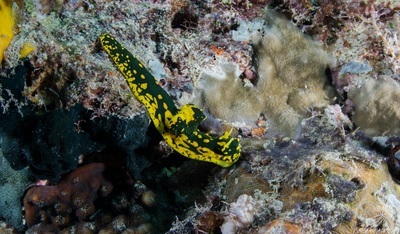 Feeds on toxic sponges and incorporates the roxins into its mucus. TAMBJA GABRIELAE Location:Raja Ampat,Indonesia This species has a dark base color with large yellow or orange spots and marginal bands. The rhinopores are black with an orange apex. Light green pigment is present on the gill branches. It has a body length of about 65 mm. 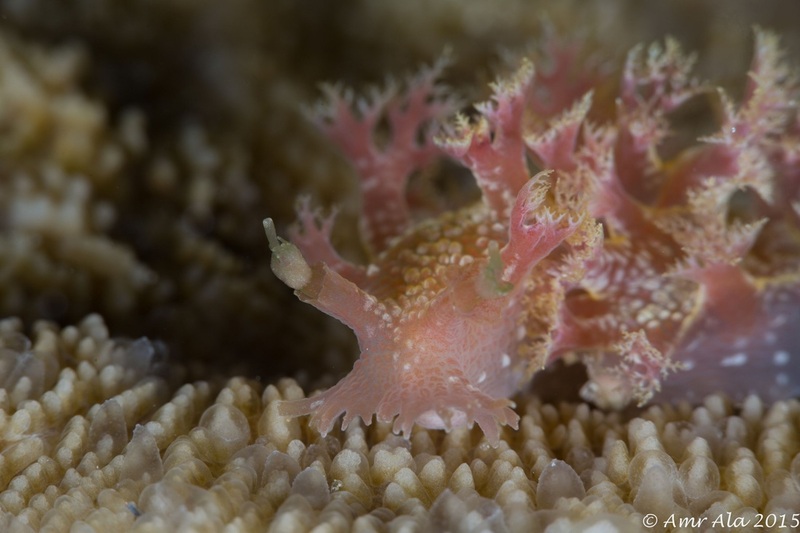 Cup-coral slug (Phestilla melanobranchia) Location:Raja Ampat,Indonesia To 3.5 cm. Cerata orange to dark brown, depending on coral prey. 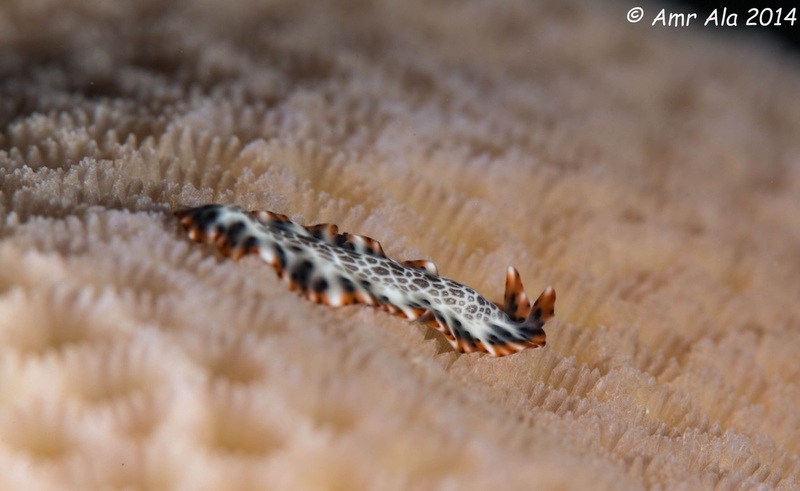 Biology: on shallow reefs, usually under Tubastrea corals on which it feeds. 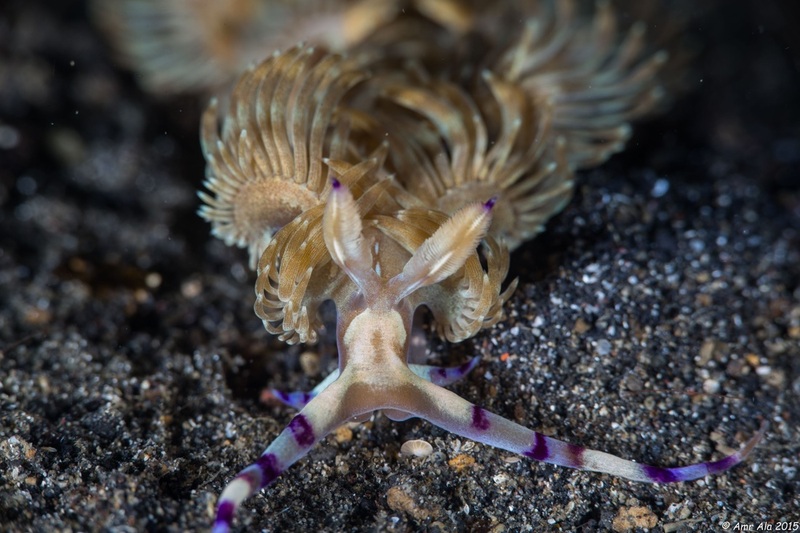 Also feeds on hydroids. Deposits white egg masses directly on these corals. 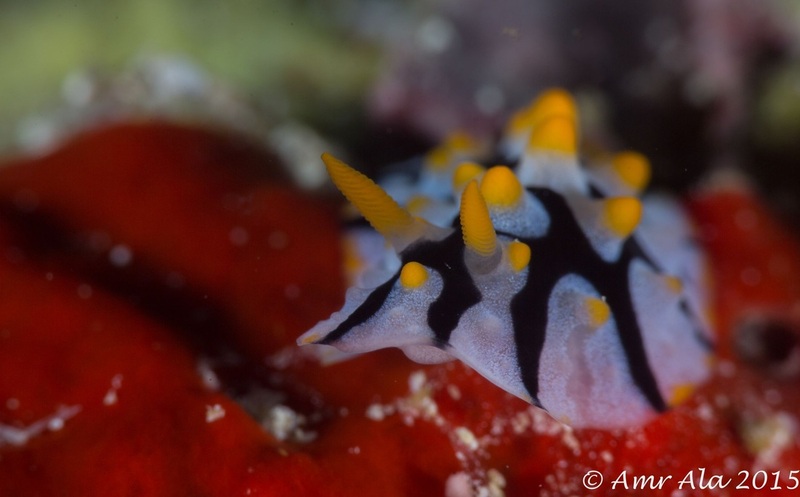 KENTODORIS RUBESCENS Location:Lembeh,Indonesia This nudibranch has a bizarre shape. 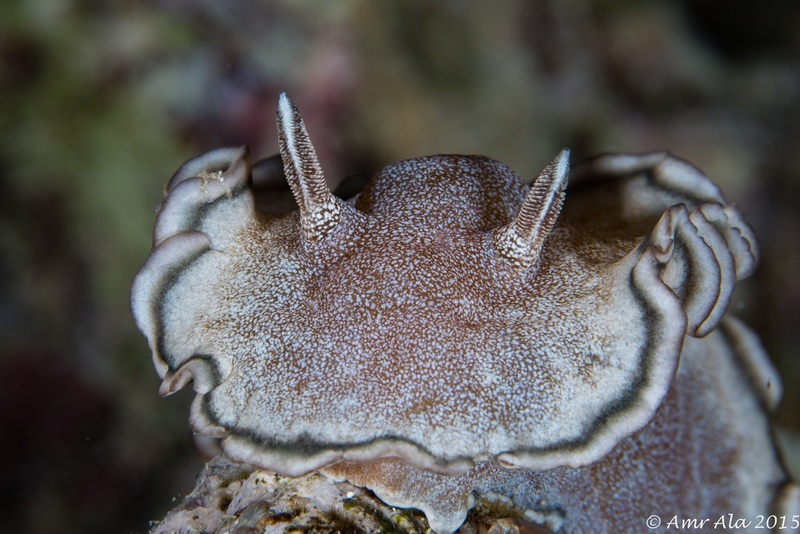 It has a high branchial pocket where the gills stand erect. It has a white base color and black to brown lines on the body. The gills and thick rhinophores are brown. 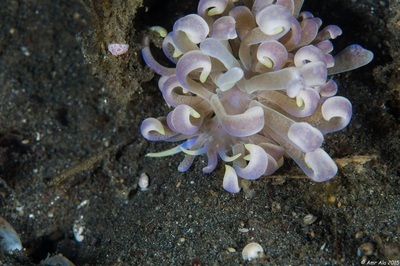 This species is often found making a pink ribbon egg mass. The body size of length is up to 17 cm. Purple flabellina (Flabellina rubrolineata) Location:Jeddah,Saudi Arabia To 4 cm. Colour variable: usually pale with 3 violet stripes; cerata with orange-purplish tips. Biology: reef slopes and walls. 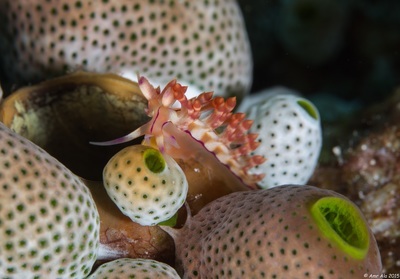 Feeds on hydroids and horny corals, common.